Typeface designing is the starting point, the place where the alphabetical writing and the image writing found a place of interaction. The linear text is involved in a larger visual dimension, it’s difficult to study writing without understanding how some of its basic elements work and it’s wrong to design a typeface (in particular for a newspaper) without thinking that it will be used in a non linear context. A newspaper page, like the phone bill, is another daily synsemic artifact we can read without problem. We are able to read the hierarchy of the news, considering different sizes and positions, and we can feel if a certain font is in harmony, or not, with the space of the text. The characteristics of a typeface must live in interaction with the newspaper design, the size of the columns, the relations between different elements (titles, subtitles, captions, different kind of articles, pictures), the colour of the page, the mood and the global identity of a newspaper. So the question should be: “How to design a typeface that suit synsemic uses?”. This entry was posted in Post in english and tagged Type Design. Bookmark the permalink. 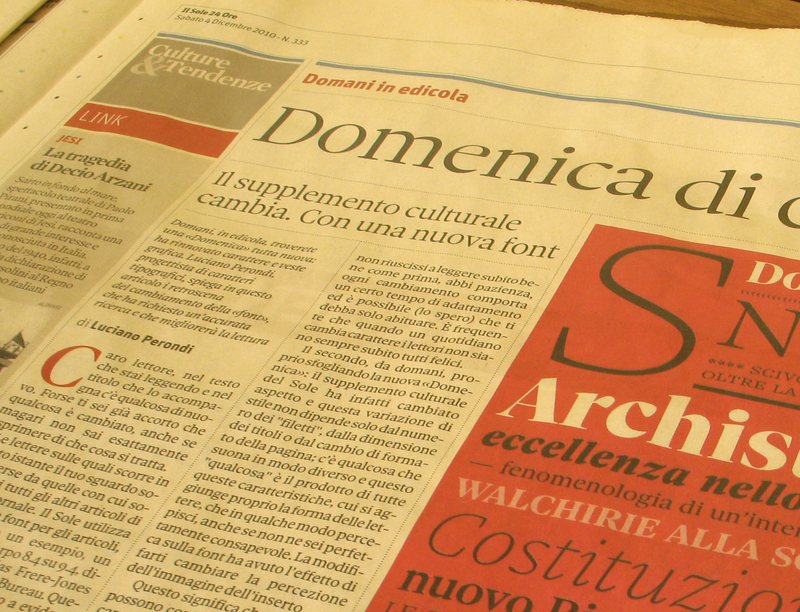 Bellissimo carattere il Sole Serif, davvero complimenti, non vedo l’ora di leggere la Domenica di domani! Da domenica prossima non mancherò all’appuntamento, ma qualcuno sa se sia possibile richiedere l’arretrato?